Below is a video created by MVLS to explain expungement law. Expungement is the removal of records from public inspection. 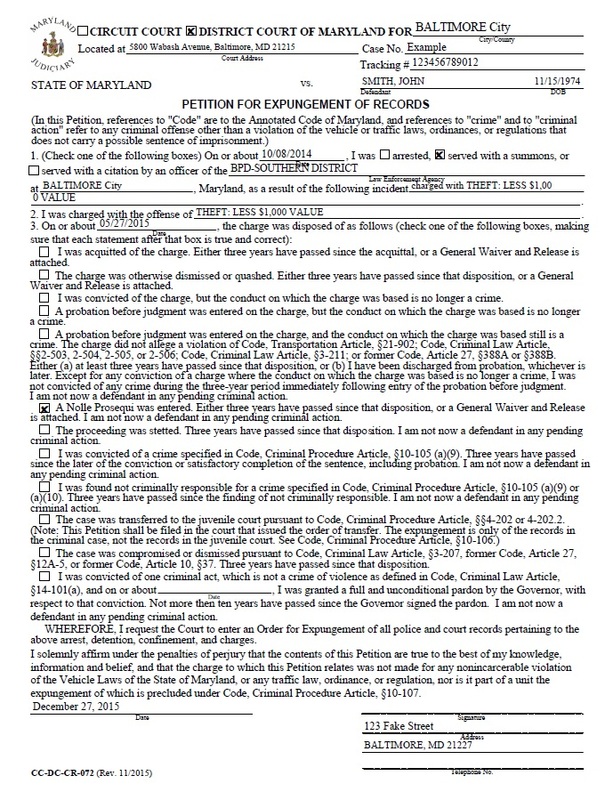 In Maryland, records maybe expunged from 1) Motor Vehicle Administration files, 2) police files and 3) court and police files. This means background searches should not be able to find the case and the case is removed from the Maryland Public Case Search Website. Once expunged, you may answer NO to the question "Have you ever been charged with/convicted of a crime?" on CERTAIN employment forms. In general, cases in which you recieved no Guilty dispositions are expungeable. Whether a case is expungeable falls primarily on the type of dispositions (verdicts) that you recieved, the date you recieved the dispositions, and in some cases what you were charged with. There is a lot of misconception on expungement law. Under expungement law there is no difference between a felony and a misdemeanor. There is also no generic waiting time before any record can come off. Not everything can be expunged. Some cases stay on a persons record FOREVER. Below is a table of all the possible dispositions, whether they are expungeable, and the waiting period, if any, before you can file for expungement. Make sure you read the section afterwards on the "Unit Rule" before attempting to determine whether you case is expungeable. Guilty Guilty dispositions usually are NOT expungeable. There are two exceptions. The first is if the crime was a nuisance crime. The second exception is if the crime is no longer a crime. This second exception applies primarily to possession of marijuana under 10 grams. For a nuisance crime you must wait 3 years from the disposition date or satisfactory completion of the sentence, including probation, whichever is later. For crimes which are no longer a crime, you may file for expungement immediately. Not Criminally Responsible Usually not expungeable. However, the charge is expungeable if the charge is for a nuisance crime, trespass, disturbing the peace, or telephone misuse. You must wait 3 years before filing for expungement. Probation Before Judgment(PBJ) PBJ's are expungeable unless 1 of 2 things apply. First, a PBJ for a DUI/DWI is not expungeable. Second, if you were subsquently convicted of a crime within 3 years of your PBJ disposition, and that new crime is not itself expungeable, then you cannot expunge the original PBJ case. For instance if you recieved a PBJ on theft in 2005 and then recieved a Guilty on trespass in 2007. The PBJ on theft from 2005 can no longer be expunged. Had you recieved the Guilty on trespass in 2010 instead of 2007, the PBJ could have been expunged. So long as you have a PBJ that is expungeable, you must wait either 3 years or the length of any probation given, whichever is longer. You may attempt to file before 3 years by filing a motion with the Court arguing there is "Good Cause" to expunge the case early. Stet Expungeable You must wait 3 years before filing for expungement. You may attempt to file before 3 years by filing a motion with the Court arguing there is "Good Cause" to expunge the case early. Nolle Prosequi Expungeable No waiting period. However, if you are filing within 3 years from the date of disposition, you must also file a "General Waiver and Release". Not Guilty/ Acquittal Expungeable No waiting period. However, if you are filing within 3 years from the date of disposition, you must also file a "General Waiver and Release". It should also be noted that if you only recieved Not Guilty dispositions, the Court will not require the normal $30 filing fee. Dismissed Expungeable No waiting period. However, if you are filing within 3 years from the date of disposition, you must also file a "General Waiver and Release". Transferred to Juvenile Court Expungeable No waiting period. Unit Rule: The Unit Rule states that if one charge in a case cannot be expunged, then the case as a whole cannot be expunged. This can lead to some unfair results. For instance if in the same case you recieved a Nolle Prosequi on Attempted Murder and a Guilty for Theft under $500, the case cannot be expunged because the Guilty disposition locks in the case. YOU CANNOT EXPUNGED INDIVIDUAL CHARGES. It should also be noted that the unit rule technically applies to all charges arising from the same act. So in the previous example, if the State had seperated the two charges into two seperate cases, the result would not change. Pending Case: If you currently have a pending criminal case then you cannot file ANY expungement petitions. You pending criminal matter must first be finished before filing ANY expungement petitions. This does not apply to pending civil cases. A current divorce case or foreclosure for example, does NOT count as a pending criminal matter. You need to fill out an expungement petition for each case NOT each charge. If the one act lead to multiple cases, you still only need to file one petition. You file the petition in the Court that handed down the disposition. If a case started in District Court and went to Circuit Court, you would file one petition in Circuit Court. There is a $30 filing fee for EACH petition.